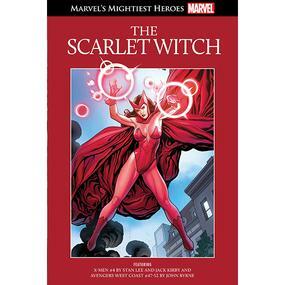 Before actually picking up Wanda’s comic book, I felt like I got to know her character very well, through the other comic books in this collection… and the Avengers: Age of Ultron movie. I thought it was really good to see Wanda’s first appearance, along with her brother. I liked the fact that they were clearly reluctant to cause harm to people on a worldwide scale and that they had a lot of depth to them. A lot of what I’ve read about Wanda would suggest that she might be close to being vastly overpowered. However, I felt that her weaknesses clearly defined hr as much as her strengths. It was good to see Wanda interacting with many of the other heroes (and villains) in both sets of comics. In the second set, I felt a lot of sympathy for her from the beginning. While I’m sure that Hank’s reasons for not helping Wanda were good, I felt that he dismissed her too easily; and I could understand why she sought help in another direction. I thought the elements of the romance between Wanda and the Vision were intriguing and although I didn’t see anything of Wanda and the Vision actually being together, I could definitely see the problems they were having and understand how hard things were on them. I thought it was pretty awful that Wanda was apparently being used and manipulated by so many different people. It was good to be able to see so many of the different Avengers… though there were some I found myself very unsure of. I thought that Wanda’s care for her children came across really well, no matter what the cause for their existence was. I found myself really aching for her. I have emotionally connected with many of the characters in these comic books… but I think the strongest so far has been with Wanda. Although I like Pietro, he’s a bit less sympathetic than Wanda is. I enjoyed being able to see Hank and Jan in these comics. I wasn’t sure what to make of Tigra, though. I wasn’t clear what was going on with her. But these comics were intriguing and I was happy to get some background to Wanada and have the opportunity to see more of the superheroes. I’d be interested in reading about her and the Vision in the future.